Ajmer is located at an altitude of 200 meters from sea-level with co-ordinates 26° 27, N. lat. and 74° 44, E. long. Situated on slopes of Taragarh hills, Ajmer occupies the heart of Rajasthan. Ajmer is surrounded by Tonk & Jaipur districts in east, Nagaur in north, Pali district to the west and Rajsamand & Bhilwara district to the South. 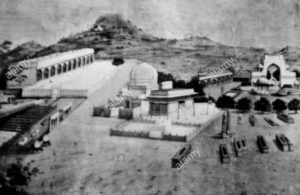 The history of Ajmer sublimes in 7 century A.D, when scion from Macavati of Chauhan dynasty, Ajaipal established himself at Ajmer and erected the fort of Tarragarh(present name). His successor Dola Rae, lost Ajmer to Islamic Invasions, to be recovered by Manik Rae. Rao Beelundeo defended Ajmer against Mahmud of Ghazni and Ajmer continued to be ruled by Chauhan dynasty, in spite of repeated invasions by Turkic Muslim armies from Central Asia across the north of India. Prithviraj Chauhan, also known as Rai Pithora succeeded to the throne in 1178 CE at the age of 13. Chauhan defeated Muhammad Ghori in the First Battle of Tarain in 1191 but was defeated, captured at the Second Battle of Tarain (1192). Khawaja Muinuddin Chishti famous as Garib Nawaz, visited Ajmer during reign of Prthvi Raj Chauhan and established the Chishti Order of Sufism in the Indian subcontinent. Even after Ajmer was conquered by Muhammad of Ghor, founder of the Delhi Sultanate, in 1193. The Chauhan rulers were able to gain autonomy upon the payment of a heavy tribute to him. Ajmer regained independence under the ruler of Mewar in 1365. 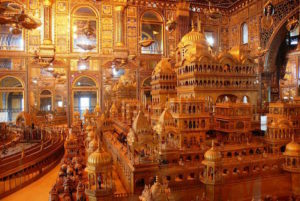 Shortly there began contest between Maharajas of Mewar and Marwar for control of Ajmer, until 1532 when it was conquered by the Marwar. In 1553, the state was controlled by the Hindu Emperor Hem Chandra Vikramaditya (Hemu). In 1556, Hemu was defeated and killed in the Second Battle of Panipat and control of Ajmer passed to the Mughal emperor Akbar in 1559. It was in Ajmer that Sir Thomas Roe, as ambassador of King James I of England, had his audience with Emperor Jahangir on 19th January 1616 A.D. which laid the stepping stone of the British Raj in India through the charter of free trading granted to the East India Company by the Emperor. In 1627 A.D, it was in Ajmer that Shah Jahan, on the death of Jahangir, proclaimed himself Emperor of India while returning from Udaipur and proceeding to Delhi. And after a furious battle on 11th, 12th and 13th of March 1659 A.D, it was in Ajmer again that a beginning of the decline of Moghul Empire was made with the victory of Aurangzeb against his brother Dara Shikoh . In the early 1700s century, control passed to the Marathas. In 1818 Ajmer became part of the Province of Ajmer-Marwar in the colonial British Raj when British forced the Marathas to cede the city for 50,000 rupees. 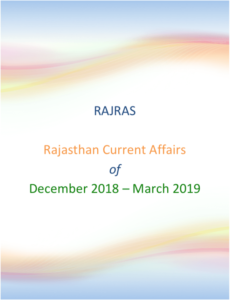 It consisted of the districts of Ajmer and Merwara, and were physically separated by the territory of the Rajputana Agency. 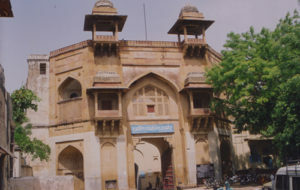 Ajmer-Marwar was directly administered by the British Raj, by a commissioner who was subordinate to the Governor-General’s agent for Rajputana. Pushkar Fair is one of the largest cattle fairs in the country which is held every year at Pushkar on Kartik Poornima (Full Moon, Oct-Nov). Apart from the buying and selling of livestock, it has religious significance become an important tourist attraction. Competitions such as the “matka phod“, camel races, parades, “longest moustache”, and “bridal competition” are the main draws for this fair which attracts thousands of touristsThe 12 day affair has a religious significance too. Hundreds of horses, camels and buffaloes are brought here to be sold. Vendors sell handlooms, snacks sweetmeats, ice crushes, Bangles, Camel Saddles etc. The entire town comes to life with men wearing colourful turbans and women clad in gorgeous odhnis. With the setting of the Sun, the atmosphere resounds with bells ringing and worship is called ‘Deepdaan’ and the entire lake is illuminated with floating lights . The view is mesmerizing not just at the lake, market but also at the sandunes of thar & camel safari. Pushkar Fair Dates: 8-14Nov. 2016, 28 Oct. to 4 Nov. 2017, 15-23 Nov. 2018. Ajmer Urs (death anniversary) is the largest Muslim fair in India where thousands of devotees pilgrimage for the Sufi saint Khwaja Moinuddin Chishti at the dargah of the saint in Ajmer. The Urs celebrations continue for six days, commencing with the hoisting of a white flag on the tomb by the Sajdanashin (successor-representative) of the Chishtia order. Over the following days, the tomb is ritually anointed with rosewater and sandalwood paste; qawwalis are sung and poetry recited in praise of the Almighty, to create an atmosphere of brotherhood and happiness amongst people of different backgrounds. Taragarh fort was first built by Chauhan king Ajaipal on Taragarh Hill. It is also said that Rana Sanga’s brother Prthvi Raj made a portion of for his wife Tara and named it Taragarh. The fort guarding Ajmer, was the seat of the Chauhan rulers and was again believed to be built by Mughal ruler Akbar. Taragarh is reputed to be one of the oldest hill forts in India and the world.The battlements run along the top of the hill. The walls are two miles (3 km) in circumference and the fort can only be approached by way of a very steep slope. When it fell to the British Raj, the fort was dismantled on the orders of Lord William Bentinck and was converted into a sanatorium for the British troops. Adhai din ka Jhopra is actually a Masjid built by Qutub-ud-Din-Aibak, first Sultan of Delhi, in AD 1199 . Sultan Iltutmish had subsequently beautified it in AD 1213 with a screen pierced by corbelled engrailed arches which appears in this country for the first time. However, a large number of architectural members and sculptures of temples are lying inside the verandah of the complex for safety and security purposes by the department which shows the existence of a Hindu temple in its vicinity during circa 11th-12th Century AD. 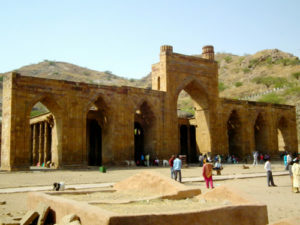 This mosque, built from the dismantled remains of temples, is known as Adhai-din-ka-Jhonpra possibly from the fact that a fair used to be held here for two and a half days. Ajmer Sharif, situated at the foot of the Taragarh hill, is the shrine of Khwaja Moinuddin Chishti. It contains the domed tomb of the saint and several white marble buildings arranged around two courtyards, including a massive gate donated by the Nizam of Hyderabad and the Akbari Mosque, built by the Mughal emperor Shah Jahan. Akbar used to come here by foot on pilgrimage from Agra every year in observance of a vow when he prayed for a son. The large pillars called “Kose (‘Mile’) Minar”, erected at intervals of two miles (3 km) along the entire way between Agra and Ajmer mark the places where the royal pilgrims halted every day. This fort was constructed in 1570 by Akbar and is also called as Daulat-khanna or Magazine. 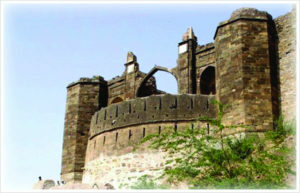 Plans for battle of Haldighati were finalized in this fort in 1576 and Jehangir camped in the fort for 3 years to bring mewar under mughal control. This fort is a magnificent example of Mughal architecture and it is the location from where Salim, as the Emperor Jahangir read out the farman permitting the British East India Company to trade with India. In 1801, control of fort passed to British who converted it into magazine (armory). Currently, the fort is converted into a state museum and houses a collection of Mughal, Rajput armour and sculpture. The fort also has beautiful paintings and Janana portion has excellent picchkari works. It houses the tomb of Khwaja Husain Chishty Rehamatullah Alaih (Shaikh Husain Ajmeri) who was the Peer of Ajmer Sharif Dargah in Emperor Akbar’s Time, He was the great grandson of Khwaja Moinuddin Hasan Chishty Rehmatullah Alaih, his tomb was built in 1637–1638 by Khwaja Alauddin Chishty and Sajjadanashin Hazrat Khwaja Moinuddin. Mayo College was founded in 1875 by Lord Mayo, Viceroy of India. The architecture of the school buildings is in the same style as royal Rajasthani architecture. The school’s main building, in white marble, is a classic example of Indo-Saracenic architecture. The eastern portion of the district is generally flat, broken only by gentle undulations. The western parts, from north-west to south-west, are intersected by the Aravalli Range. Many of the valleys in this region are sandy deserts, part of India’s Thar Desert, with an occasional oasis of cultivation. Some fertile tracts are also present; among these is the plain on which lies the town of Ajmer. This valley has an artificial lake, and is protected by the massive walls of the Nagpathar range or Serpent rock, which forms a barrier against the sand. The only hills in the district are the Aravalli Range and its offshoots. The Banas River touches the south-eastern boundary of the district near Samur. Khari river forms the boundary between Ajmer and Bhilwara districts. Luni river which is a major source of irrigation and fulfilling water requirements of central, western and south west Rajasthan has its origin in the valley of Nag Pahar. Two small streams—the Sagarmati, Saraswati, pour their waters into Luni. Dai River, also originates its Ajmer and flows in south-east direction to meet Banas. River Rupangarh origins near Salemabad(Ajmer) and runs in north-east direction to fall in Sambhar lake. It is an artificial lake built in 1135 -1150 AD by Arnouraj Chauhan, the grandfather of Prithvi Raj Chauhan III. The lake is named after him. The lake is spread over 13 Kilometers. The pavilions or Baradari of Sangmarmar marble at Anasagar were built by Shahjahan in 1637 and the Daulat Bagh Gardens were bulit by Jehangir. There is a Circuit house on a hill near the lake that used to be British Residency. There is an island in the center of the lake which is accessible by boat. Lake Foy Sagar is an artificial lake built by an English engineer, Mr. Foy in 1892 AD. This work was taken up to provide famine relief through wage employment to locals. Lake Foy Sagar offers a beautiful view of the Aravalli range. Pushkar Lake around which the Pushkar town has developed is located amidst Aravalli ranges approx. 12 kms to the north-west of Ajmer city. The mountain range called as Nag Pahar (“snake mountain”) separates the lake from the city of Ajmer. The valley is formed between the two parallel ranges of the Aravalli hills running south-west to north-east. The lake is considered Sacred and a prime Hindu pilgrimage also regarded as “Teerth Raj” in local dialect. Todgrah-Raoli wildlife Sanctuary is situated in 3 districts including Pali, Ajmer & Rajsamand. It has 475.2 Square kms of area, which is habitat to panther,hyena, wolf, green pigeon and jungle fowl. 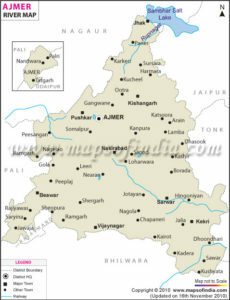 Ajmer district is the prime producer of quartz and leading producer of feldspar. Other mineals available in the district are basemetals, cement grade limestone, granite, marble, asbestos, wollastonite, garnet, calcite, emerald, soapstone, magnesite, fluorspar, mica etc. According to the 2011 census, Ajmer has a population of around 551,360 in its urban agglomeration and 542,580 in the city. In average literacy, Ajmer occupies 8 position among districts of Rajasthan. 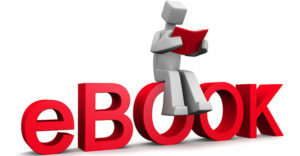 It has male literacy rate is at 82.4 percent and female literacy rate of 55.7 percent to have combined rate of 69.3 percent.